This is one of my first cards that I have done. For me this card-making-magic.com is the best site for a newbie like me. I try to look at the tutorial as often that I can and learn as much as possible. I'm quite happy with this card and hope that my daughter in law (Angelica) will be happy to receive it. She is absolutely PINK, so I'm sure this will suite here. 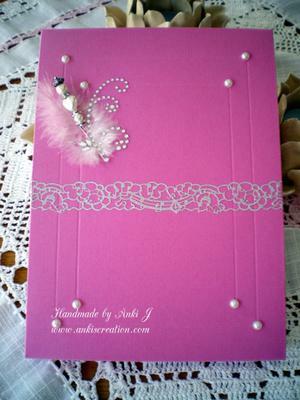 I started my card by creating a A5 card base with pink cardstock. I cut the next layer a bit smaller with Silver cardstock. I stamped Floral Lace Vintage Cling Background Stamp on designer paper with Versamark and white embossing powder and heated to set. I adhered background to cream cardstock layer and then onto card. I stamped label from Magnolia Vintage Labels Seven Clear Stamps on designer paper with Versamark and white embossing powder. I die cut label with coordinating die from Vintage Labels Seven Dies. I also faux cut the same dies in dark pink cardstock. stamped with black ink and then adhered to center of card with foam squares. The flowers and leaves were die cut using Spellbinders Sprigs, Blooms One, Blooms Three and Blooms Four. It took me 2 days to finish the card and box. I call the card Angelica, because she is the receiver. The card is beautiful and I am sure that it will be much loved by Angelica and adding it to a matching box makes it even more special. You have created a really good card using Marisas' inspiration and you should ... quite rightly ... be proud proud of your take on her design. I often visit Marisa Jobs' blog to see some of the wonderful cards that she makes. 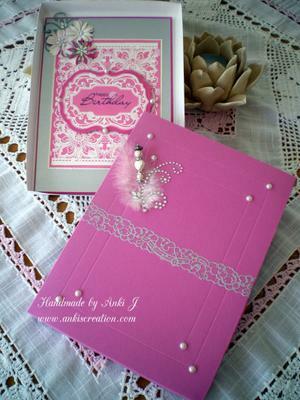 What a beautiful card and if it is one of the first ones that you have done then you have done a brilliant job. I'm sure your daughter-in-law will be delighted with it. hello anki, what a very beautiful card you have made! lovely! Hi Anki,this is a beautiful card. 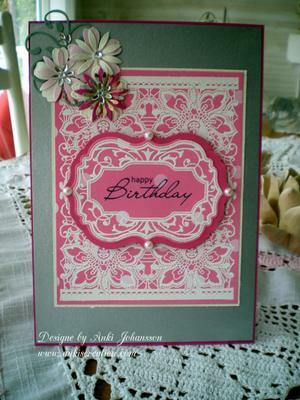 Really love the vintage lace background stamp. Love the box too.